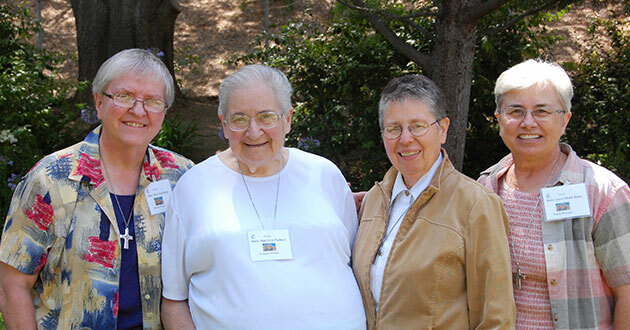 Justice, Peace and Integrity of Creation (JPIC) coordinators from each Sisters of Notre Dame US provinces met in California in June to share their achievements from the past year and set new goals for the future in keeping with General Chapter 2010 Document. 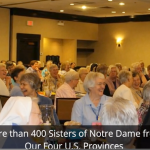 JPIC initiatives cover a broad range of issues that the Sisters of Notre Dame are passionate about including global conservation and human trafficking. 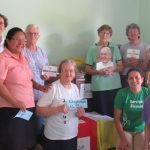 Sister Mary Lea Paolucci from the Covington, Kentucky province reported that her community held a purse and shoe drive that raised $2,100 to install a water tank in Buseesa, Uganda. Sister Mary Ann Baran from the Chardon, Ohio province discussed her involvement with the nonprofit Water for Life Institute, which “uses a combination of appropriate water technologies, water health education and basic research so that communities can identify and solve their water problems” according to their website. In addition, Sister Joyce Marie Bates filled the group in on her research into micro-financing projects in the US and abroad; and Sister Betty Mae Bienlein stressed the importance of educating other sisters about JPIC. This year all four provinces held Awakening the Dreamer symposiums for their communities. Awakening the Dreamer educates and motivates participants to do what they can now to curb climate change. The sisters believe that every small act of respect for the earth and other people is important, and they chose Awakening the Dreamer to communicate that message to a larger group of people. Respect is a key concept in JPIC initiatives. “Respect for the earth, for the animals, for people and for the whole cosmos is our ministry,” said Sister Betty Mae. She hopes that sisters and others will make an effort to stay aware of JPIC issues via daily news and that together we will show hope and joy in the face of those challenges.